Norfork Lake fishing is in transition to the fall fishing pattern. This basically means that fish can be and are at any depth in the lake. The fish will soon start to school up and feed heavily for the winter months. Over the last 3 days I have noticed that the largemouth and smallmouth bass are moving to the shoreline. With the lake still about 6 feet over normal pool we still have buck brush under water. The bass are up in this brush. 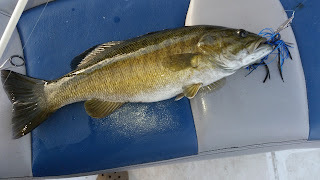 I have fished several different methods for bass; top water, casting a chatterbait and casting a shallow diving crankbait. 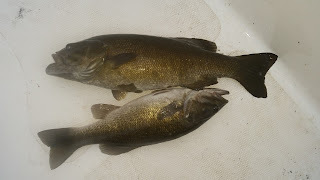 All 3 baits have produced some nice keeper size large and smallmouth bass as well as many short fish. I've been fishing the wind blown main lake points as well as secondary creek and cove points. The fish are up tight to the bank. You will catch lots of bass, but most will be on the short side. Bluegill are along the shoreline near sunken brush piles in 20-30 feet of water. A couple of our guests fished yesterday afternoon and brought back a basket full of nice sized bluegills. Crickets are deadly. White bass can be found back in the major creeks following the shad. I haven't found any top water action lately, but the trollers are having fun. Last week I had a big group of guys here fishing in their club tournament. 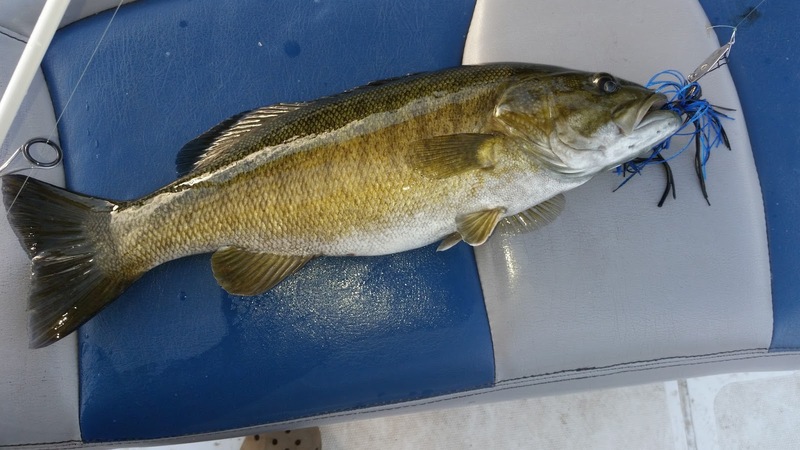 They caught many whites, largemouth and smallmouth bass during their stay. A few of the guys were trolling a deep diving crankbait, removing the end hook and replacing it with a leader and a small Rooster Tail. The whites loved it. Stripers and hybrids are on the move and are starting to school. Sunday morning I was fishing a deep bluff line point and had huge schools of fish show up. I had live thread fin shad down 30 & 50 feet. I was also jigging a spoon. The live bait poles started to get hammered, but the bites were not super aggressive. I managed to land 2 hybrids in the 6 - 7 pound range and missed too many to admit. :-) I had several good bites at 50 feet, but sad to say I missed all of them. I suspect the deeper fish were the stripers. These schools of fish are constantly moving so if you are in the right place at the right time you will see more fish than you know what to do with! I keep checking my normal fall haunts as these fish will eventually get more consistent on these feeding locations as the lake water temperature lowers. These fish will be at all depths from along deep water bluffs to deep flats. 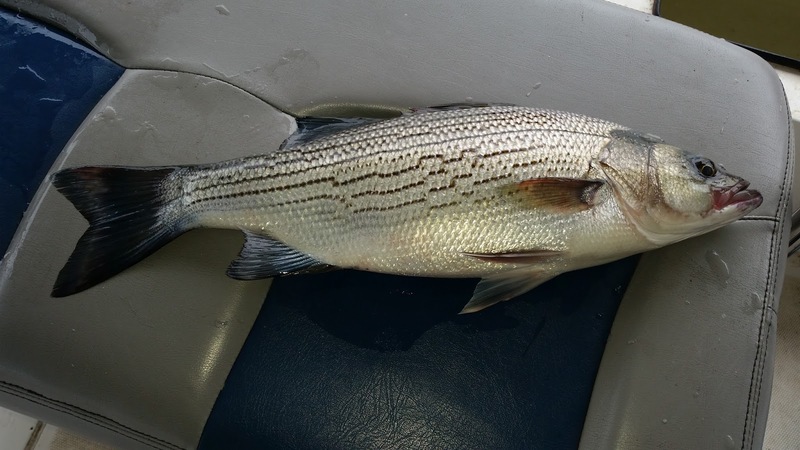 Top water action for striped bass and hybrid bass typically starts when the water temp gets into the 60's. The current Norfork Lake water temperature this morning was 73 - 74 degrees. It should continue to fall each day. The lake level is at 560.46 and continues to fall 3 - 4 inches per day. Normal pool is 553.75. The main lake is clear and the creeks and coves are stained, but starting to clear with the cooler water temps. It looks to be another great fall fishing season.